It's been a long time coming, but I think an upgrade to my web presence was long overdue. I began this blog in 2005 and it's served me well over the last 13 years. My goal in those early days was to write a short story every month. Back then, that was the only writing I was doing. 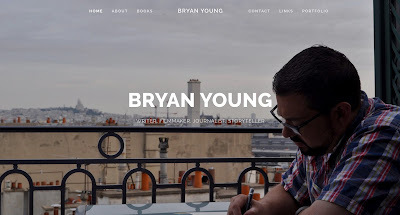 This website, then called "Bryan's Short Story Corner," got me into a regular writing habit. One that I still maintain today. I hoped it would help me get eyeballs on my words and, looking back at some of those early short stories, I shouldn't have wanted any of those eyeballs looking. Today, my Patreon fills that void. There is a dedicated group of supporters there that help subsidize my ability to write short stories on the regular. After I started publishing books, this blog morphed into a place to talk about my projects and writing and it worked well enough for that for a long time. But now I have Twitter and Medium for those functions and they have much cleaner and easier interfaces, both for you as a reader and for me on the back end. Then this place morphed into a spot for me to have a web presence as an author. But this really wasn't the place for that. The user interface and templates for blogger were cutting edge in the early 2000s, but now? They just don't look professional. Or slick. And I would get embarrassed every time I had to send people to this spot. So, I came up with a new, professional landing page at Swankmotron.com. What does that mean for this space? I'll leave it here as an archive, but the lights will dim. You'll be able to walk around the archives. Don't mind the dust or cobwebs or bad writing. And don't judge me too harshly for how dated this space will appear as the years go on. Thanks so much for sticking with me here for all these years. This space connected me with a lot of people I still communicate with over all these years and I'll be forever grateful for that. Thank you even more than that, though, for following me on my journey beyond this space.